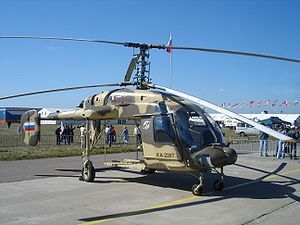 A twin turbine version of the successful Kamov Ka-26, (a single turbine version was called the Kamov Ka-126) the Ka-226 was initially announced in 1990. Originally developed to meet the requirements of the Russian disaster relief ministry, the aircraft first flew on 4 September 1997. Certification to Russian AP-29 'A' and 'B' transport categories was granted on 31 October 2003. The Ka-226 entered production at "Motor Sich", Zaporozhye, Ukraine. Six Ka-226 helicopters with Rolls-Roye engines have been ordered by the Russian MOD in 2011.